Media Research Center President and NewsBusters.org Publisher Brent Bozell today issued a public statement in which he demanded that MSNBC accept responsibility and apologize for concocting a racially charged "news" story that falsely accused a supposedly white health reform protester of carrying a gun out of hatred for a black President. NewsBusters.org's Kyle Drennen initially reported on this on Tuesday, and yesterday provided an update: that the Second Amendment Foundation, as the name would suggest a gun-owners rights group, had condemned the liberal network for "using deceptively-edited video from a Phoenix, Arizona anti-tax rally on Monday to invent a racial stereotype in its on-going effort to demonize and marginalize American firearms owners as ‘racists.’"
After Politico.com picked up Kyle's initial NewsBusters.org item, an MSNBC spokesperson attempted to justify the slander: "Contessa was speaking generally and not about that specific person with the automatic weapon." But Brewer did specifically cite an unidentified African-American man who attended a protest outside of a Monday speech by President Obama: "Yesterday, as President Obama addressed the Veterans of Foreign Wars in Phoenix, a man at a pro-health care reform rally just outside, wore a semiautomatic assault rifle on his shoulder and a pistol on his hip." On Sunday evening, NewsBusters colleague Noel Sheppard highlighted a health care-related story from the Canadian Press (CP), which is that country's rough equivalent to the USA's Associated Press. The incoming president of the Canadian Medical Association says this country's health-care system is sick and doctors need to develop a plan to cure it. If you were a reporter trying to gauge the credibility of Obama administration protests that it is really serious when it says that it will honor patient, doctor, and family treatment wishes in serious illness situations if the government takes an exponentially greater role in health care, you might look into how areas of health care already controlled by the government are dealing with these sensitive matters. Apparently either no journalist has cared to look, or if anyone has looked, they haven't found anything they believe is worth reporting. In today's Wall Street Journal, Jim Towey, a former director of the Bush White House's Office of Faith-Based Initiatives and founder of the nonprofit Aging with Dignity, found a troubling, newsworthy, death-encouraging decision that has already been made during Barack Obama's short term in office. 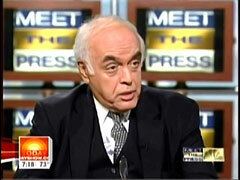 The network morning news shows could not have cared less about the passing of conservative columnist Robert Novak. While ABC, CBS and NBC all ran obituaries during their August 18 evening news shows, ABC’s Good Morning America and CBS’s The Early Show completely skipped over Novak this morning, not once mentioning his death. A candidate for lieutenant governor of the great state of Vermont may be under criminal investigation for lewd acts in public. Oh, and by the way, he’s a Democrat. One might miss that fact by reading the NBC affiliate’s report too quickly – the party affiliation of state Senator Ed Flanagan is buried in the tenth paragraph. One might argue that noting the party affiliation of Vermont politicians is somewhat redundant; however, one must also recall that Senator Bernie Sanders is an independent-leaning-socialist and the governor is a Republican. Another local report completely omits his party affiliation. 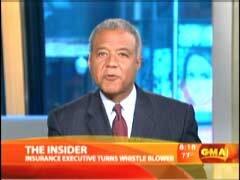 On Saturday’s House Call program, CNN’s Sanjay Gupta finally reported the left-wing affiliation of a “health insurance insider” glowingly featured on his network. Gupta noted that Wendell Potter was a “senior fellow at the Center for Media and Democracy” and that the former Cigna spokesman was now “pro- a public insurance option.” He didn’t label Potter’s organization or position as leftist. The following day, ABC’s Good Morning America on Sunday ran a sympathetic piece on Potter’s “personal journey from health industry insider to outsider” that treated him as a subject of a human interest story. Despite reporting on the fellow’s “loss of income, status, position and colleagues,” correspondent Ron Claiborne omitted Potter’s new liberal affiliation. 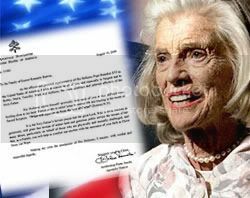 If you only read the Associated Press, New York Times, and Washington Post obituaries of Eunice Kennedy Shriver, who died last Tuesday at age 88, you would have no idea that she was one of the last of the old Guard, pro-life Democrats who went down fighting in 1992. That was when the party's presidential nomination of Bill Clinton moved the party firmly into the pro-abort camp, a position from which it has never returned. Barack Obama's presence in the White House virtually guarantees that Democrats in most quarter will either condone, support, and in some cases even celebrate the 1,000,000-plus unborn infants who perish each year. That was not where Ms. Shriver stood, as many prolife publications noted shortly after she died. The Catholic News Agency obituary called her "distinctively Catholic," recounting that she was "an early supporter of the pro-life Susan B. Anthony List. 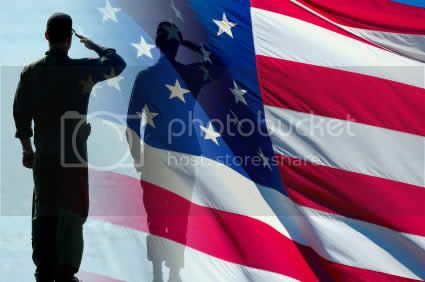 She and her husband also supported Democrats for Life of America and Feminists for Life." The Washington Post editorial page threw itself today into quite an odd political position. Mr. Deeds's strategy of stressing abortion may work or backfire; time will tell. But to suggest, as the McDonnell campaign has, that a campaign discussion about abortion "is engaging in the politics of division" is disingenuous and wrong. Thousands of Virginians have abortions every year, a decision that touches on families and futures. It's a fair and pressing topic of debate. That is a somewhat perplexing position. On its face, that appears to be gently pushing McDonnell to engage on an issue critical to winning over Virginia voters. The problem is, the Post’s position would throw the current debate among Virginia voters wildly off-topic, according to no less a source than a recent Washington Post poll. Readers are advised to make peace with the Maker soon. If we are to believe the recent utterings of United Nations Secretary-General Ban Ki-moon (pictured at right), humanity -- or at least humanity living life as we know it -- is not long for this earth. The Sec-Gen's August 11 speech at the Global Economic Forum in Incheon, South Korea, was so over the top that it's likely the world's media kept its coverage of the event relatively muted to spare the poor man from worldwide embarrassment. 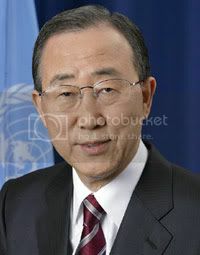 There is nothing about the speech that I could find in searches on "Ban Ki-Moon United Nations" (not typed in quotes) at the New York Times or the Washington Post. A search on the same string at AP.org at 3:30 p.m. came up empty. An identical Google News search came back with a very light total of 42 results. 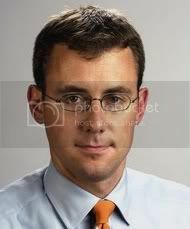 In an August 14 report appearing on the front page of the paper's August 15 print edition ("Health Debate Fails to Ignite Obama’s Web"), Jeff Zeleny of the New York Times (pictured at right) gave readers a fairly accurate impression, while avoiding the word, of activism turning into apathy in Barack Obama's DNC- and White House-orchestrated Organizing for America (OFA) effort. While Zeleny's report and detailed work came out of Iowa, his key finding is intended to be a national temperature gauge: "But if a week’s worth of events are any measure here in Iowa, it may not be so easy to reignite the machine that overwhelmed Republicans a year ago." That's why it's odd, to say the least, that Zeleny ignored the results of the nationwide reignition attempt that occurred and largely failed this past week, namely its "Office Visits for Health Reform." In fact, there are some signs that "Office Visits" did OFA's cause more harm than good. Seton Motley, the Media Research Center's Director of Communications, was on the Fox News Channel's Glenn Beck to discuss the Federal Communications Commission (FCC)'s new "Chief Diversity Officer," Mark Lloyd. Chief Diversity Officer Lloyd is virulently anti-capitalist, almost myopically racially fixated and exuberantly pro-regulation. He is a frightening guy to have having any power at the Federal Communications Commission (FCC). And yet that is exactly where he currently stands, astride the private radio industry he loathes like a Socialist Colossus. It does not bode well for free speech on the radio airwaves, but as Seton says to Glenn during this appearance, "That's irrelevent to these people."